Ten years after the tragic events of September 11, 2001, America is, in some aspects, a different country. Significant portions of the federal budget over the past decade have been spent on enhancing preparedness and security on the home front, and prosecuting terrorism in Iraq and Afghanistan. 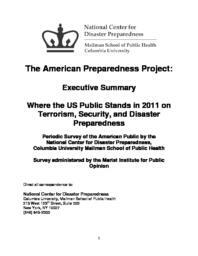 As part of its American Preparedness Project, which has tracked US attitudes on domestic preparedness and terrorism over the last ten years, the National Center for Disaster Preparedness (NCDP) at Columbia University's Mailman School of Public Health recently surveyed the US population to determine their current attitudes and behaviors regarding disaster preparedness and the prospect of domestic terrorism. NCDP and the Children's Health Fund had conducted this survey annually from 2002 to 2008. As in prior years, the Marist Institute for Public Opinion (MIPO) executed a survey designed by NCDP and CHF. Also as before, the 2011 survey included a mix of previously-asked questions and new questions inspired by recent world events. Trended questions asked about confidence in government; extent of personal and family preparedness; and perceptions of community preparedness. All questions are shown in Table 1.